Zing Nutrition Bars are quietly becoming a hit in the athletic community. NFL Pro Bowl Tight End Tony Gonzalez recently recommended Zing bars in his new book, The All-Pro Diet, co-written by sports dietitian, Mitzi Dulan. Professional sports teams such as the Stanley Cup Champion Chicago Blackhawks and the Seattle Mariners order Zing bars for their athletes. They also come highly recommended by Nancy Clark, a bestselling author and sports nutritionist formerly pictured on Wheaties cereal boxes. After 18 months of research, development, and testing, the perfect bar was ready to be introduced to the marketplace. In 2008, Zing rolled out 3 original flavors with a soft launch that catered primarily to their own patients. After word got out, Zing expanded their line and started offering their unique bars to the public. Zing bars come slickly packaged and are available in 6 delectable flavors—oatmeal chocolate chip, chocolate peanut butter, peanut butter chocolate chip, cranberry orange, almond blueberry, and chocolate coconut (the newest flavor). The chocolate peanut butter flavor (coated in organic dark chocolate with peanuts) was definitely my favorite out of the 5-pack that Zing sent me for this review, with the refreshing cranberry orange flavor coming in a close second. What really stood out for me is that the bars have a smooth texture and a nice, clean taste that doesn’t leave you with a nasty aftertaste full of chemicals, as is so often the case with many nutrition bars. Once you eat a Zing bar, it sits well and makes you feel energized. While the Zing bars definitely pass muster in the taste department, the key question is whether they can satisfy the nutritional needs of elite athletes and provide them with the needed performance edge. Zing bars use 100% natural ingredients and have an optimal balance of high quality protein, low-glycemic carbohydrates, and beneficial fats (from nuts). All Zing Bars are made from hormone-and antibiotic-free ingredients, and contain nothing artificial. There are no artificial sweeteners, colors or preservatives; the sweet taste comes from low glycemic organic agave syrup. There are no synthetic vitamins or minerals or allergy-aggravating gluten, wheat or soy protein. There are no unhealthy trans fats or empty calories. Zing bars contain an ideal ratio of protein, carbs, and fats for sustained energy. Each bar contains between 10-13g protein (whey or rice protein), 20-28g of carbs, and 7-10g of total fat. This combination of protein and fat slows the absorption of glucose (from carbs) into the bloodstream, providing for stabilized blood sugar, moods, and energy throughout the day. They are also a great source of fiber with 3-5g in each bar. In an oversaturated health bar industry, Zing bars are the perfect snack that will give you a nutritious, competitive edge. 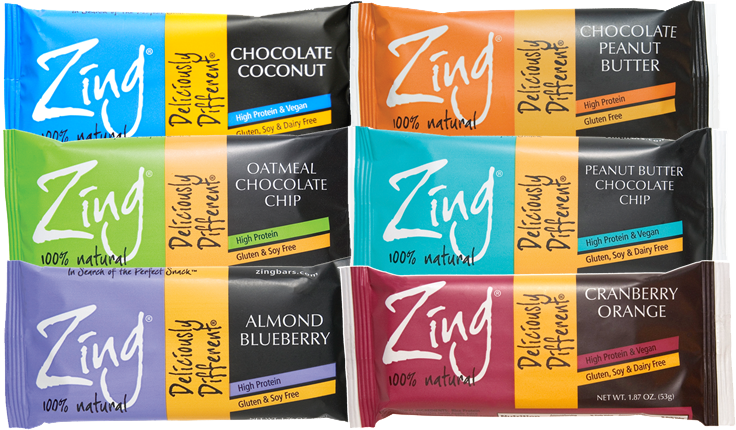 For more information about Zing Bars, please visit www.zingbars.com. The first 5 people to ask a question about Zing Bars or nutrition will receive a free Zing Six Pack. Be sure to include your email address when submitting your comment. Zing Bars is also offering a 20% discount on any online purchase for Access Athletes readers for the next two weeks (deadline is August 31st). Visit Zing’s online store and use the discount code “ACCESSZING”. i want to try out zingbars! are the oatmeal chocolate chip and cranberry orange flavors nut-free? i ask because i have food allergies. it is tough to find nutrition bars that are nut-free, obviously, as even the majority of these have nuts. i hope at least one of these flavors is! I am not much of an athlete, but I do drink coffee and red bulls before work. Would a regime of zing bars before work provide the same pep-up I receive from these stimulants? First off thanks for the question and a good one at that. The bars are all nut based, either peanut, almond or cashew. I wish you the best in finding the bar that suits your special needs. You are of course eligible for the free Six Pack since you did post a question. So we will be in touch and thanks again for your interest. Thanks for the question. Well, I hope your into nutrition bars as much as you are your morning cup of Joe, because you of course will be receiving a six-pack for asking your question. The answer is NO, there are no stimulants in the bars. The Zing you may physically feel really has to do with sustained energy. The agave nectar used as a sweetener doesn't spike your blood sugar, so there are no crashes. The bars in that sense may help you stay out of your afternoon rut, if you experience one after your morning burst of energy. Hope this helps. Sounds like a great relationship between AA and Zing. Like Lindsay, unfortunately I have food allergies as well :o(. What type of presence does Zing have in the world of professional golf? I am curious to know the amount of calories in each bar and how many of those are fat calories. Great question, cuz it got me thinking and curious and digging for some research. First off, I am not one of the founding nutritionists at Zing, so if one of them wants to add to this Q tomorrow don't be surprised this is my "layman" response, however. The bars are all 210 calories with calories from fat ranging from 60 to 90. I personally have wondered about the Cal. from fat in the past and your Q sparked me to google it and I found this link http://bit.ly/cvlRmY which you or someone else in cyberspace may find interesting (I did anyway). Great question and thanks for asking it. I don't want you to think we skipped your Q. We actually have another representative from Zing answering your question because he is doing something directly related with golf, so stay tuned. Sounds like a perfect complement to a cup of coffee and the morning news. Or even an afternoon snack when much of the working class starts feeling sluggish. If they pass the taste test, I'll put the Kashi bars to rest. Alma, what is your most popular flavor? First off, congrats on having the 5th question asked. This is my favorite question, because it conjured the image of me drinking coffee enjoying our ever popular Chocolate Coconut bar, so popular we have run out twice that I know of. Alas, more are coming. I wasn't even a coconut person. I used to pick the chocolate off of Almond joys and throw the rest out. Coming in a close second for me is Peanut Butter chocolate chip, honestly though each bar tastes great. Thanks again for the great Q and I hope you enjoy your six-pack of bars. David, one of the Zing founders here. An important note about the fat in the bars is they come from nuts (peanuts, almonds or cashews) which form the base of each bar. These are primarily mono-unsaturated fats which are heart healthy and one reason the Mediterranean diet provides such great health benefits. Combined with high fiber and lean protein, the bars (and the Med Diet) are one of the healthiest snacks you'll find.